Refrigeration users. Ideal for maintenance/service engineers involved in general engineering, e.g. food process plants, pharmaceutical companies, transport and communication companies. Hospital engineers would benefit plus commercial companies with responsibility for building services maintenance. Recommended for short training courses in refrigeration and air conditioning and for students taking NVQ or GNVQ courses. 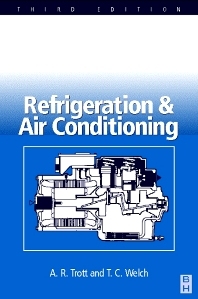 Preface; Fundamentals; The refrigeration cycle; Compressors; Oil in refrigerant circuits; Condensers and water towers; Evaporators; Expansion valves; Controls and other circuit components; Selection and balancing of components; Materials. Construction. Site erection; Liquid chillers. Ice Brines. Thermal storage; Packaged units; Refrigeration of foods. Cold Storage practice; Cold Store construction; Refrigeration in the food trades - meat and fish; Refrigeration for the dairy, brewing and soft drinks industries; Refrigeration for fruit, vegetables and other foods; Food freezing. Freeze drying; Refrigerated transport, handling and distribution; Refrigeration load estimation; Industrial uses of refrigeration; Air and water vapour mixtures; Air treatment cycles; Practical air treatment cycles; Air-conditioning load estimation; Air movement; Air-conditioning methods; Dehumidifiers and air-drying; Heat pumps. Heat recovery; Control systems; Commissioning; Operation. Maintenance. Service. Fault-finding. Training; Efficiency and Economy in operation; Catalogue selection; Appendix; References and notes; Index.